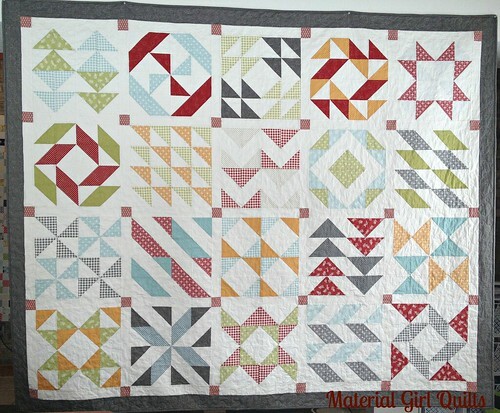 Here it is...My finished Layer Cake Sampler quilt! 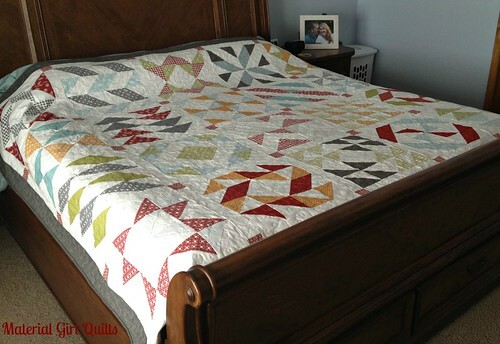 Thanks for all of the kind comments on my sneak peek last week :) This quilt was so much fun to design and put together. 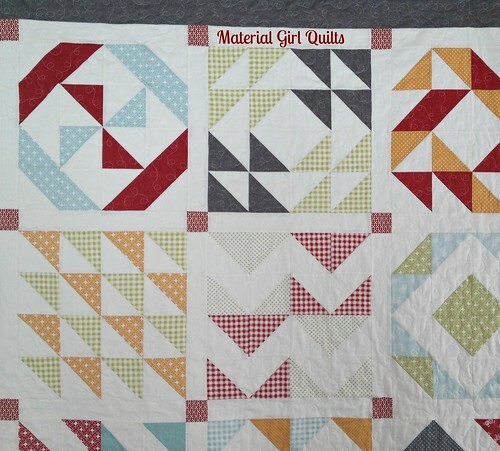 I have always loved half square triangles and all that you can do with them. 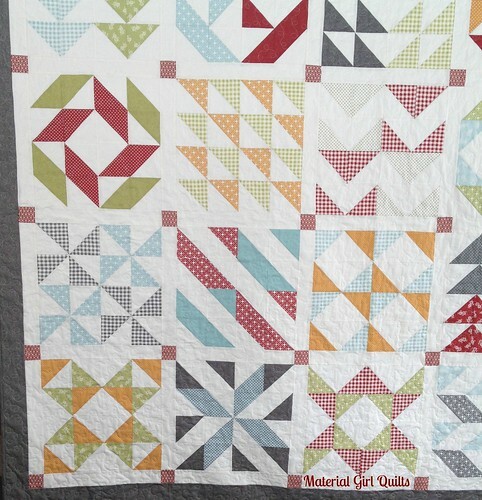 I think a sampler quilt is the perfect way to showcase that. And what better way to create a awesome sampler than using a layer cake of a favorite fabric line?! 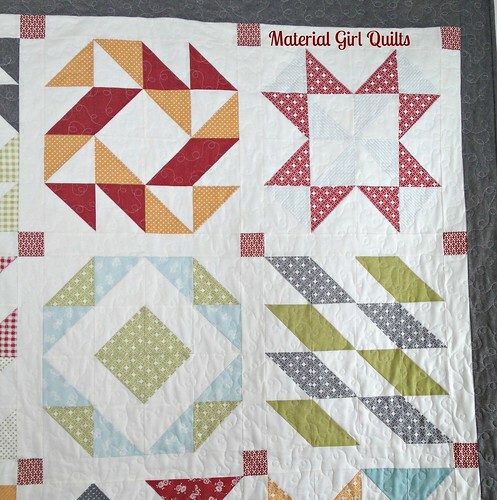 For this quilt I used a Moda Flats layer cake by Angela Yosten along with a Moda Bella layer cake in white for the blocks. Each block consists of 2 print and 2 background layer cake squares and finishes at 16". My husband asked what my favorite block is and it's too difficult to decide! I love them all and I really love the colors in this fabric line together. They are such great prints too. 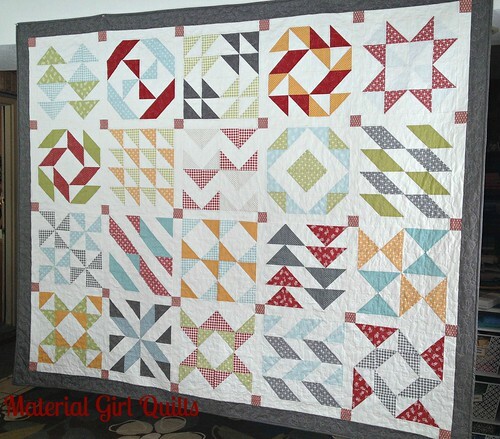 Now, here is the very exciting news about this quilt...I'm going to host a quilt along and demonstrate how you can make your very own Layer Cake Sampler Quilt!!! 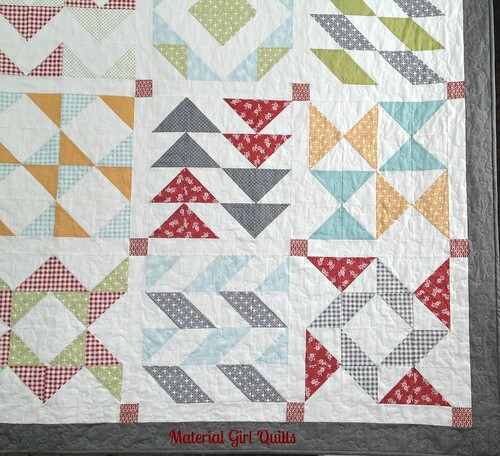 The full quilt along schedule will be posted on Friday (2/7/14) along with details for fabulous prizes available from Moda, Aurifil and Material Girl Quilts! So, what do you think? Would you like to quilt along with me? I had to share one last photo with you. 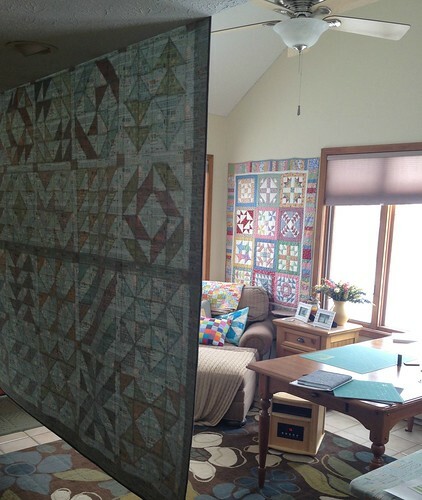 We had yet ANOTHER snow day at our house with way too much snow on the ground for outdoor photos...so I had to improvise ;-) The light was pretty good in my sewing room, so I hung it up in there to get some photos of the entire quilt top. And, it worked! In this photo you can see my other sampler quilt made in 30's reproduction fabrics (one of my all time favorites). Thanks so much for stopping by and I hope you will join me in the quilt along. Remember...details will be coming on Friday.